You’ve got your brand new home security system and are now wondering where to place them. You’ve come to the right place. We’re going to give you the rundown on where to put home security cameras for the maximum home protection and safety. Keep on reading for all the tips and tricks for security camera placement. We’ll start with the five most common place to put a home surveillance camera. An estimated 34% of burglars enter a home through the front door so it just makes sense to place a security camera there. One thing to be aware of is that a bad buy may attempt to tamper with a surveillance camera placed in plain sight near the front door. They could rip it off the wall, disconnect the power or smash it. It’s best if you place a security camera on the second floor, or in the eaves of your roof and point it down towards the door. Pro Tip: You may want to consider installing a peephole door camera as well. The best ones will send you alerts when motion is detected at your front door, which will go a long ways towards reducing unwanted intruders. Approximately 22% of bad guys enter a home though the back door. This is high enough that it certainly warrants a security camera. The back door can be a tempting target for thieves because it’s often out of sight out neighbours. This is particularly true if you have a backyard surrounded by a high fence or lots of trees. Keep in mind the same tip as the front door camera. Don’t place it where it can be easily smashed or destroyed. It’s best to place a surveillance camera on the second floor and look down towards the back door. Thieves will sometimes break a window in order to gain access to your home. They most often choose one that is off the street in order to decrease their chances of being caught. Survey the area around your house. Do a walk-around. Which window is the most secluded, and out of the view of neighbours or a passerby? Put a home security cameras there. If it’s dark, be sure to install a solar powered security light as well in order to reduce the change that your house will be broke into. There are plenty of things in the backyard or unlocked storage shed that could attract the attention of a thief. Lawn maintenance equipment, bicycles, etc. There’s sometimes a thousand dollars worth of stuff just left out. Most burglars will gain access to your backyard through the gate. It’s easier than jumping, or breaking a fence and will create less of a disturbance in the neighbourhood. So be sure to place a security camera pointing towards the backyard gate. Also keep this area well-light to increase the safety of your home. Pro tip: It’s useful to put some security cameras out of reach of the bad guys, pointing down at something like a window or door. But, you can also put some in plain view because this will often make the thief just move onto an easier target. When there’s one security camera, there’s usually more. Intruders know this. Most basements have small windows that a person can fit through. This can be an easy way for an intruder to gain access to your home and they’re sometimes unlocked because people don’t check on them for years. It can be useful to place a home security camera looking at the stairs leading up from the basement. Some thieves will get into the basement first, and then use that as access to the main level of your home. What about Fake Security Cameras? 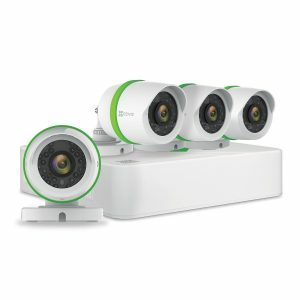 If you’re on a very limited budget, you may not be able to afford a home security system with 4 or 5 cameras. It can indeed get a bit expensive. A nice solution is to get 2-3 security cameras, and then supplement that with fake security cameras. We find that the dummy security cameras these days are surprisingly realistic and most people can’t tell the difference until they’re less than a meter away. Put the real security cameras in the hard to reach places, looking down at your front and back door. Then, use fake cameras for the back gate, and side windows. Place them in very obvious spots where a burglar would be sure to see them. It’s a simple solution and will hopefully offer you some serious protection for your home and family. Learn more about where to place dummy security cameras here. There are a few common things that people do which will render your home security system useless! Avoid this by not doing these common mistakes. If a home security camera is placed too low to the ground, it’s very easy for a burglar to smash it. Avoid this by placing it out of reach. 9-10 feet usually works pretty well. Another thing to consider is the weather. Although most outdoor security cameras are weatherproof, it’s best to not test this by installing them under a bit of cover, such as the eaves on your house. Do you want your security camera to see who’s at the front door, find out the license plates of people who drive down the street, and the house across the street? This is a mistake and won’t work that well for you. Each camera should have only one main task. It can be tempting to place a security camera at the highest point on your property so you can get maximum coverage. However, this isn’t ideal because although you might see an intruder, you won’t be able to see his/her face clearly. This is not helpful for police in identifying the criminal. An average house usually needs at least 3-4 cameras outside to ensure some good coverage. 5-6 is even better. 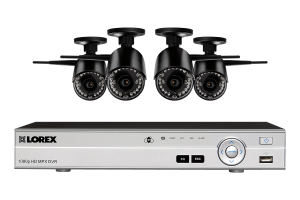 When you buy a home security package such as this one from Lorex, it’s usually not that much more money to get 6 cameras instead of 3, so it makes sense to just get more from the start. Night vision works decently well for most of the higher-end security cameras. However, it can still be a bit hard to make out identifying features if it’s pitch black outside your house. Getting some good lighting around your house will help the police to ID a bad guy. It’ll also help to prevent criminals from wanting to break into your house in the first place. Each jurisdiction has different laws about home, or business security cameras. Before buying a home security system, and certainly before installing it, be sure to get all the details about this. The Internet is an excellent source of information, or give a local home security system company a call to find out more. As a general guideline, cameras should be pointed at your own home or property. For example, you shouldn’t point a home security camera into your neighbours yard because this is a serious invasion of privacy. Where to Put Home Security Cameras? Have your Say! 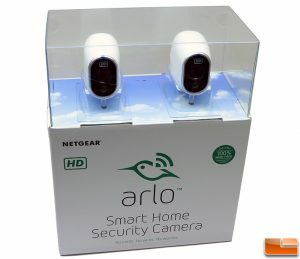 Do you have any recommendation about where to put home security cameras? Leave a comment below and let us know your thoughts. Do you want to learn more about home safety and security? Check out these Top 15 Home Safety Tips.